This Orange Massachusetts motel is 10 minutesâ?? drive from fishing on Lake Mattawa and 7 miles from hiking around the Quabbin Resevoir. Guests staying at Executive Inn can enjoy a continental breakfast with coffee and doughnuts. The property also offers guests free Wi-Fi that is available throughout the property. 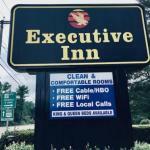 A cable TV and a refrigerator are provided in every room at the Executive Inn Orange. Free toiletries are available in the en suite bathroom. Dining options like Herrickâ? 's Tavern and White Cloud Restaurant are less than 2 miles away. Skydiving with Jumptown at Orange Municipal Airport is 2 minutesâ?? drive away.